New Canaan Mounted Troop on Monday, May 19, 2014. Sacha Chen-Schaab graduated from New Canaan Mounted Troop's cadet program with the rank of captain in 1982. He was leaving the place where he spent a decade not only horseback riding, but taking care of the horses and the barn. "For me, it was sort of like Scouts on horseback," Chen-Schaab said. "I wasn't any good at basketball, or baseball, or anything that an American boy should be able to do. This was the sport that I was good at." But Chen-Schaab moved on, sort of. He started a career in business management and later moved to Australia, where he became a teacher and administrator. Then he moved to Southeast Asia and spent 16 years in Singapore. Though he never rode horses in Asia, Chen-Schaab never forgot those 10 years he spent with the NCMT. "It was always on the back of my mind," he said. "That experience was still shaping who I was as an adult." Chen-Schaab returned to his home state of Connecticut and December and just four months later landed a job in the same place where his passion for horsemanship was born. 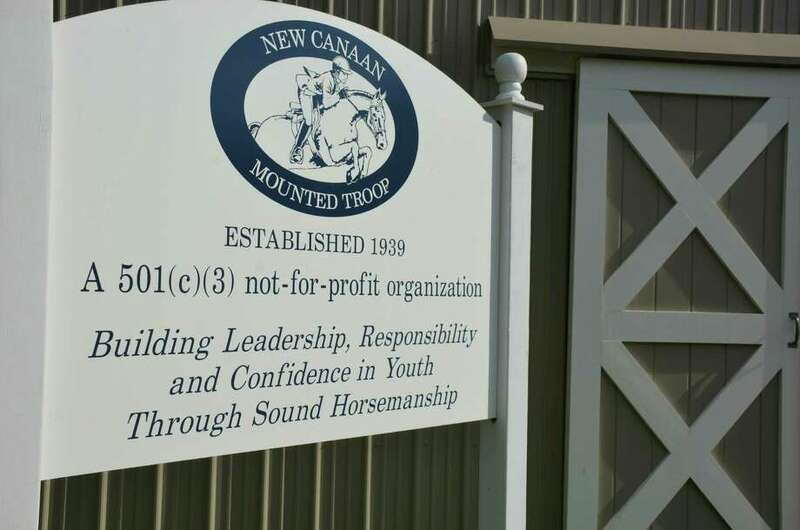 For more information, visit newcanaanmountedtroop.org or call 203-966-0634. All proceeds from the party will benefit NCMT's charitable programs. He is now a development director for the NCMT, a New Canaan institution that is celebrating its 75th anniversary this year. Decades after he graduated from the NCMT, Chen-Schaab found a place that hasn't changed much, at least when it comes to its mission. The NCMT still is all about the children and hands-on learning. On Saturday, May 31, the organization is celebrating its anniversary with a combined "Round-Up" barn dance and alumni reunion. The event will feature an equestrian drill team demonstration, live music, dinner and a raffle drawing for cash prizes. The nonprofit charitable and educational organization was founded in 1939 by noted horsewoman, educator and author Margaret Cabell Self, who died in 1996. Self personally trained thousands of young people at the NCMT and wrote more than 40 educational books for children. Though the facility, the staff and some of the programs have changed over these seven decades, the organization's goals still are the same. "Really, it hasn't changed. That's the beauty of it," Executive Director Lynne C. Schulthess said. "The mission and the essence are still the same." The NCMT's mission is to "build leadership, responsibility and confidence in youth through sound horsemanship." Unlike many horse show clubs, where kids "roll up, get on a horse that's already been groomed and tacked up for them, so they (can) jump on, ride around, jump off, hand it off to someone and they go home," Chen-Schaab said, the NCMT offers a more hands-on experience. "You're educating the entire horse person," he said. "You're doing everything from soup to nuts here. You're learning every aspect of the horse, how to take care of the horse, how to take care of the stable." Chen-Schaab said the process leads to a richer learning environment. "While doing all of that, the children are building confidence, they're building leadership skills, they're mentoring younger children," he said. The NCMT's flagship cadet program is available to students between 7 and 18 years old and combines weekly group riding lessons and participation in the equine care program, which consists of a weekly Equine Care Day, or "Barn Day," and training on horse care and stable management. Schulthess said all children and teens "take care of the horses, mentor the younger kids, they feed, they water, they hay, they clean the barn." Doing such chores was what Chen-Schaab liked the most about the NCMT. "I liked working directly with the horses," he said. I wanted to be with the horses. I wanted to know all the aspects of the sport." Schulthess said the organization offers more than just an opportunity to ride horses. In fact, everyone who wants to participate in a program has to learn how to take care of horses. "You can do equine care here and not ride. But you cannot ride and not do the equine care," Schulthess said. "So the philosophy of working with the horses and working with the kids has remained the same." The NCMT is the last remaining unit of the Junior Cavalry of America. New members are inductees and are promoted through the ranks of cadet, corporal, sergeant, 2nd lieutenant, 1st lieutenant and captain. The cadet major is the top rank and is elected by fellow troopers to be the leader or the program year. The facility, located at 22 Carter St., features outdoor and indoor rings, 30 stalls, several turnout paddocks, grass paddocks, a tack room and horse laundry facilities. The majority of the NCMT's 26 horses and ponies were donated. Some are retiring from show careers and others are donated because their owners can no longer take care of them. Chen-Schaab's brother and mother also were part of the NCMT in the 1970s. He noted that the NCMT is one of the few affordable organizations of its kind. "If the troop hadn't existed, I wouldn't have had the chance to ride because we could afford this place," he said. "But we couldn't afford anything that has 'hunt club' at the end." The NCMT also provides a number of scholarships to youth and it hosts summer camp sessions. In addition to the cadet riding and equine care programs, the NCMT offers therapeutic riding and ground programs, called Super Troopers, to children and adults with special physical, cognitive and emotional needs. The programs help promote physical and emotional wellness through equine therapy and horsemanship. Many of the current participants have autism, Schulthess said. Schulthess, who has been in the horse business for 30 years and has ridden with Leslie Burr Howard, an Olympic champion equestrian, said one of her goals is to make the NCMT "more visible" in town and in Fairfield County. Chen-Schaab hopes people recognize the value of having an institution like the NCMT that's been around for more than seven decades. After all, he said, "we're more than just a place where kids ride horses."